Across the globe, the past several years have seen a tremendous increase in the role of cooperative autonomous systems. The field of cooperative control and optimization has established itself as a part of many different scientific disciplines (military science, biology, communications, etc.). Nevertheless, cooperating systems have continued to be extremely difficult to model, analyze, and solve. Each year, the International Conference on Cooperative Control and Optimization (CCO) brings together top researchers from around the world to present new ideas, theories, applications, and advances in the fields of autonomous agents, cooperative systems, control theory, and optimization. 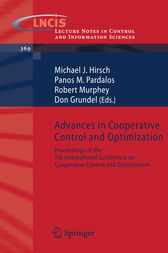 The works in this volume are a result of invited papers and selected presentations at the Seventh Annual International Conference on Cooperative Control and Optimization, held in Gainesville, Florida, January 31 – February 2, 2007. The works presented in this book are suitable for faculty, graduate students, and industrial researchers in the fields of optimization, control theory, electrical engineering, computer science, and mathematics.